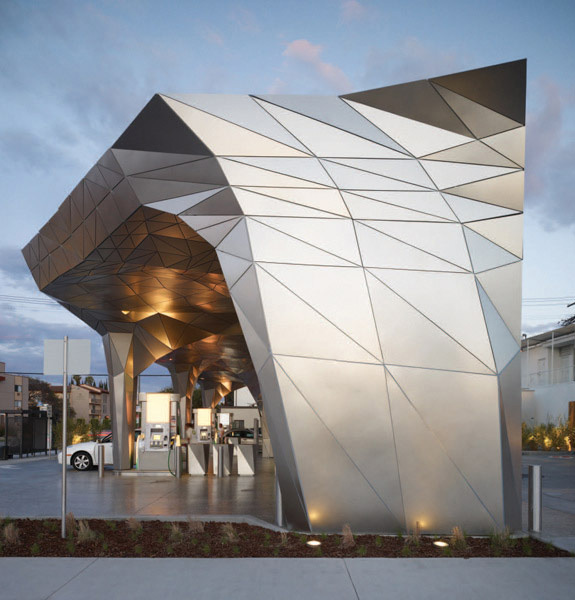 Situated at a busy residential/retail intersection in Los Angeles’s sprawling ‘suburbanism’ is Office dA’s Helios House, an astonishing prismatically opaque, stainless steel crystal canopy hovering over petrol pumps. Besides providing protection for refuelling motorists, it is a canopy that has drawn itself over British Petroleum’s marketing slogan, an attempt to send customers not only “Beyond Petroleum”, but completely past the inconvenient truths of petroleum consumption. 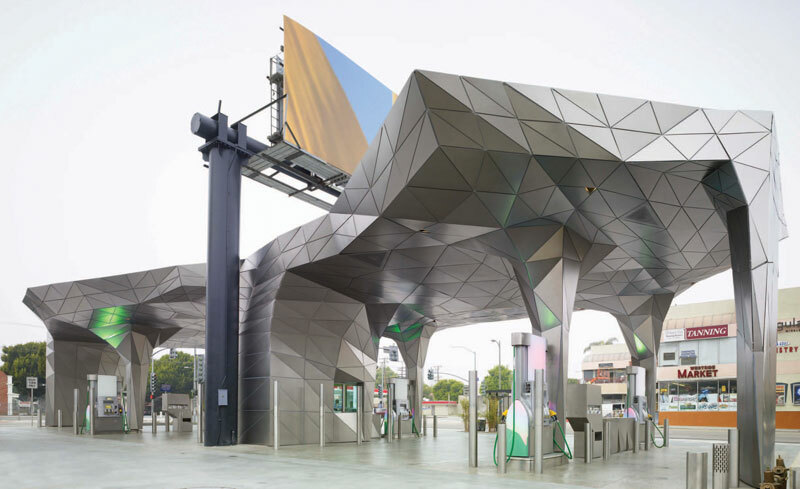 And yet, since its opening in early 2007, one wonders if this filling station’s tessellated skin isn’t already beginning to reveal fissures to the real objectives it has conveniently overlooked. In one moment it successfully demonstrates experimental design solutions for site and form while disregarding a program whose activities are automobile- and fuel-centred, and in the next it introduces a marketing ‘green team’ (station attendants) to provide energy-saving tips for the home, office and community during one’s turn at the pump, while offering nothing in the way of an alternative to the petroleum fuelled, combustion engine one has just arrived on. To fulfil Helios House’s first sustainable objective of up-cycling the previous station’s site, two massive monopole, cantilevered billboards have remained fixed in place as they were before. Office dA’s approach was not to ignore these brutally engineered advertising giants, but to have them complement the architecture. Apprehending the hidden potential of unexpected urban relationships in what the Tokyo architecture practice Atelier Bow Wow describes as a “crosscategorical hybridisation”, Office dA allows an engineering aesthetic (the billboards and filling station) and an architectural aesthetic to coalesce in the same space, ultimately elevating a radical interdependence beyond the merely pragmatic. This is just one example of this US architecture and design practice’s approach to the built environment. Led by Harvard Graduate School of Design alumni Monica Ponce de Leon and Nader Tehrani, Office dA is engaged with a seriality of material and complex geometric form. It is in their temporary installation work that one witnesses an evolution in this kind of investigation. As an oeuvre of prototype skins in tensile fluidity, these geometric manipulations reveal design methodologies and manufacturing processes borrowed from the fields of garment and product design. Helios House culminates these formal engagements with techniques based on rapid prototyping. Incorporating their knowledge of modular form and component-based systems of fabrication, a 1700-part kit comprised the entire canopy. 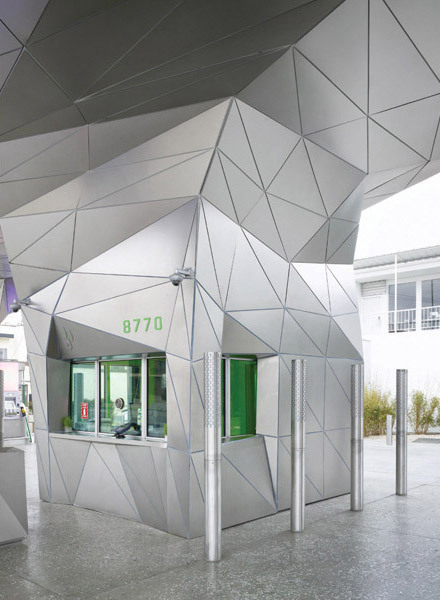 The assembly, from the uncoated recyclable stainless steel structure to the stainless steel triangles, took four weeks to erect. These building techniques were also used to construct the stand-alone restrooms located at the back of the site. Described as a ‘living lab’ Helios House incorporates a number of sustainable building products in conjunction with these advanced construction techniques, and has been awarded a LEED (Leaders in Energy and Environmental Design) Gold rating. The LEED certification program is developed and operated by the United States Green Building Council. In the US, buildings can receive a Platinum (top certificate), Gold or Silver by meeting a number of criteria. By incorporating technologies for energy reduction, infrastructures that purify, store and redirect water, and construction supplies that use materials that have been recycled, farmed, specially treated and originated from post industrial scrap, Helios House earned between 34 and 44 points out of a total 61 to receive its Gold rating. In addition to recognitions in the building industry, BP’s “greencurve” of environmental accomplishments oddly extend even further beyond the petroleum sector. Under BP’s Alternative Energy branch, Solar Home Solutions provides consumers with solar panels through the big box home improvement retail giant Home Depot. BP is also establishing wind farms in the US and investing in hydrogen and natural gas technologies, even contributing US$500 million toward alternative-fuel research through a UC Berkeley venture. Acclaimed accomplishments aside, it is important to distinguish between BP’s educational marketing campaigns, building certifications and research initiatives, and its internal culture, which is at odds with the overall environmental marketing campaign. For within BP’s not so distant past key events highlight dysfunctional flaws in its core business of petroleum extraction, processing, shipping and disposal – most notably a BP-charted oil tanker spill off the coast of California in 1991, and a pipeline spill on the North Slope of Alaska in 2006. BP desires to become synonymous with “performance, leadership, innovation, and progressive ideas”, but is unable to grasp that which Office dA knows only too well – that in order to achieve these types of business practices you have to risk becoming highly unpopular within the constituency of your core business. A truly authentic commitment would require this multinational oil conglomerate to commit to causes that appear completely antithetical – such as the new US congressional legislation that will require all automobiles to reach 35 miles per gallon by 2020, resolutions put forward at the United Nations Climate Change Conferences and, closer to home, Californias effort to sue the world’s six biggest auto makers for the ‘nuisance’ damages their products have helped create through global warming.